Devoblog / Odamex 0.8.0 Released! Devoblog / Odamex 0.7 Released! 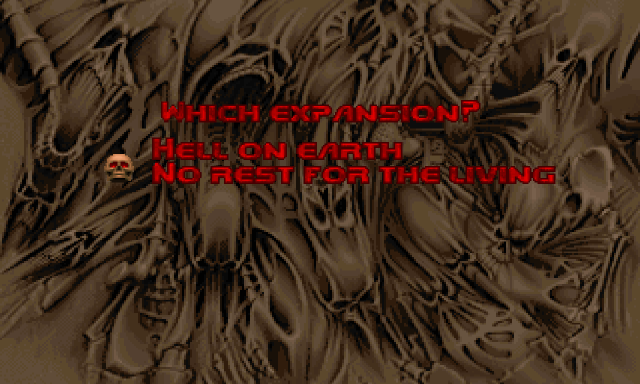 Sign-ups for the first North American Doom Association tournament are now open. The North American Doom Association, or NADA, is a 1-on-1 tournament ranking system that will run year-round. Players of all skill levels, experts and novices, are invited to play in any or all of the 24 open tournaments. The league utilizes servers on east, central, and west coasts of North America to allow for the fairest games. To sign up and join community discussion, you can visit the forums or chat at irc.quakenet.org #nadoom. As of June 12th, the Odamex bug tracker is down for necessary maintenance. Although we expect to resolve this in a timely fashion, you can post any bugs in the Temporary Bug Tracker Thread topic on our technical support forum. We apologize for the inconvenience. Odamex now natively supports widescreen field of vision on widescreen resolutions. Remove the blinders, and take advantage of that nice LCD monitor you have. Of course, there are times where you might prefer to keep a narrower field of view. Odamex not only allows you to use the stretched widescreen like in prior versions, there is an option to use a zoomed in view that has a correct perspective but still limits you to the original field of view, cutting off the top and bottom of the screen. And although it is off by default, servers can enforce the lack of widescreen, allowing players to fallback to whichever type of limited field of view they prefer. Anyone who had played Doom for a significant amount of time knows this situation. You have your opponent in your sites, you're just about to pull the trigger...but just at that moment your gun disappears and you're helplessly sawing the air while your gleeful opponent takes advantage of your misstep to put buckshot straight at your mug. No more. 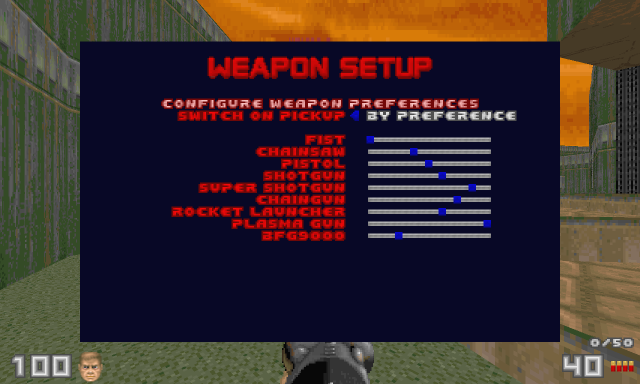 Odamex now features a more comprehensive implementation of Player Weapon Order that allows you to have two weapons with the same priority. And now it has a dedicated menu...no more guesswork. Odamex now supports resetting the map to its original state without reloading it. This opens a world of possibilities, and the first of those to be realized is Warmup Mode. When you join a server in warmup mode, you can run around and shoot other players all you like. However, frags and scores do not count, and the game is not allowed to proceed until all players have signaled that they are ready. Once they are, a countdown begins and the map resets to its original state, ready for play. There are several other possibilities that this warmup mode allows as well...you can elect to start the game as soon as the map loads, but with a countdown that allows players time to connect. Of course, this isn't the only thing that map resetting allows. The 'callvote restart' command has been overhauled to take advantage of this feature as well. Odamex now supports the new official versions of the game data packaged with Doom 3: BFG Edition. 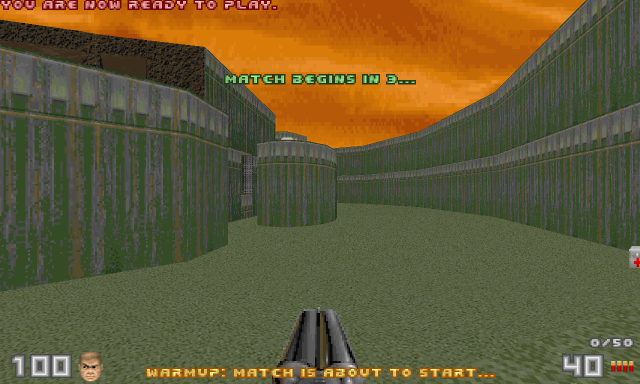 Odamex will automatically detect the BFG Edition version of the game and add support for the Doom 2 expansion episode, "No Rest for the Living". Cooperative play has gotten some much-needed attention with this release. The primary source of monster desyncs has been found and fixed, meaning that you and your buddies can finally team against the forces of hell without the demons of the internet grabbing at your ankles. Of course, we couldn't just leave you with that. In addition to a long-overdue addition that allows players to keep obtained keys after being killed, Odamex now features built-in monster health scaling and monster damage scaling. Watch your step...that puny little former human might hurt a lot more next time. Along with these additions to Odamex, there have been a numerous amount of bug fixes and improvements to the engine's networking and rendering systems. You can grab the proper download for your system at the top of the main page. Devoblog / Sparks fly; Odamex 0.6.1 released! Odamex 0.6.1 has a number of new features that should offer something for all of Odamex's users. One of the star additions to Odamex 0.6.1 are the new spectator options. You will now be able to see a player's status info and weapon when spectating, as well as their vertical mouse look pitch in servers that allow it. This is a significant change that really helps to improve the experience when watching others. There are also a number of other new related commands that can allow you to easily spy a specific player or a flag in CTF. Robust announcer support has been added as well. This mostly applies to CTF games. Players will also be able to choose their announcer style (possessive or team based). Other often requested additions that affect this type of player are player color forcing and the addition of a turnspeed variable. All players will be able to enjoy a number of renderer improvements which help prevent line "tearing". Players can also now resize their windows independent of the pre-set resolutions. This means that players who have asked for the option to maximize their windows to their desktop will now be able to do so. Server administrators now have the option of utilizing the sv_maxplayersperteam variable as well as the co_blockmapfix compatibility flag, which fixes hit-scan collision on actors that overlap more than one blockmap. This is useful due to vanilla Doom having a bug that had some shots appear to hit but do not do the damage they are intended to. There are a number of other additions and fixes which are covered more in-depth in the change log. To see more specific changes that arrive with Odamex 0.6.1, check out the more extensive list on the release page or the complete listing using our svn changelog. As usual, you can grab the proper download for your system at the top of the main page. Devoblog / Odamex 0.6 Released! Odamex 0.6 is finally here! After many months of testing, you can finally enjoy all of the new features of Odamex 0.6 on public servers. Rather than run down the huge list of changes in paragraph form here, here are links to the abbreviated changelog, complete changelog, and the actual svn changelog. In addition to these change logs, there were a number of video previews of Odamex 0.6 which can be seen on Odamex's Youtube Page. Some of the obvious highlights of this release are the addition of slopes, an advanced voting system, a brand new netdemo format, aesthetic improvements, optimized mouse input, and numerous network enhancements. However, these are simply some of the most notable additions and only scratch some of the changes that have occured going into Odamex 0.6. As always, we would like to remind our users that the Odamex project thrives off of user input, particularly when it comes to resolving bugs in the engine. As we've approached this major version over the last few months, dozens of players have pushed their time and resources into ensuring the success of Odamex 0.6. We at the Odamex team want to thank you for your continued and unwavering support. You have played a serious role in shaping this release and we hope that you are as proud as we are! This is only the beginning. We encourage everyone who wishes to continue their support to take a moment and sign up for the Odamex Bug Tracker. This has been one of our most valuable tools in development of Odamex and is our number one resource when it comes to determining our direction. If you come across something odd or broken in Odamex 0.6 that is not already listed or resolved in the tracker, please submit as much information as you can! Our project relies on the input of our average users. 1) Subscribe to the Odamex Mailing List, which will give you immediate email updates on Odamex bugs and their status as changes occur. You can do this by signing up here or email odamex-bug-reporter-request@freelists.org with "subscribe" in the subject field. 2) Join the growing Odamex Facebook Group, subscribe to our Youtube channel, and join our Google+ page. 3) You can subscribe to the Odamex release rss feed. Now go fill those servers! As some of you may have noticed, today marks the beginning of May and, perhaps more relevant to this project, the end of April. Although Odamex 0.6 was slated for an April 2012 release, the development team has made the decision to slightly delay the public release for a few additional tweaks and small bug fixes. I can assure you that the core of Odamex 0.6 is ready to go. Hours have been spent almost every night play testing with dozens of different individuals. Although these test sessions have gone incredibly smooth, we are playing the role of a perfectionist. Some of the smaller complaints and bugs we have found are being tended to quickly and tweaked to ensure that there won't be an immediate follow up to the Odamex 0.6 release because of hasty oversight. Do not be alarmed though! The new release will be widely available only in a matter of days. I promise it won't be long. In the meantime, a number of developments have happened throughout our growing community as we edge towards our 0.6 release. Many individuals have had the opportunity to play our daily builds and we are confident that our budding community will have the opportunity to flourish immediately upon release. A number of new wads are being developed specifically for the Odamex 0.6 release. Our own resident HeX9109 has taken the lead on the converting and updating many classic CTF maps in the Anthology CTF project, slated for release alongside Odamex 0.6. The Mechanix Union have also started moving the gears on Velocity CTF II. To post your own wads and get involved in mapping for Odamex 0.6, visit our Maps, Wads, and Mods forum. Perhaps one of the greatest testaments to Odamex's continued development is the International Doom League's announcement that they will be moving to Odamex full-time for their twelfth full season. 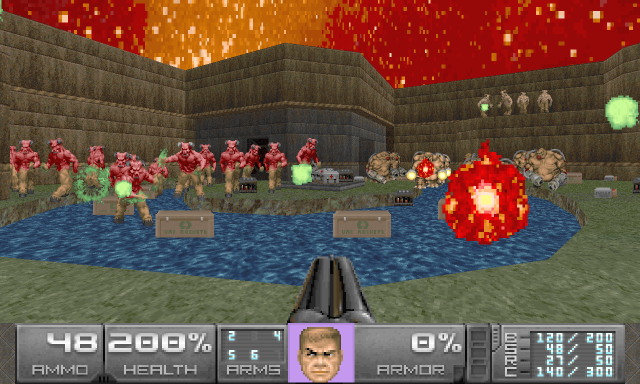 The IDL is one of the oldest and most successful leagues in the history of the Doom community. We would like to welcome the IDL into the Odamex community and both anticipate and appreciate the high level of competitive play that they should bring to Odamex starting this summer. Odamex 0.6 is not much further off, but you don't have to wait until then to get involved. You can visit either one of our IRC channels (irc.quakenet.org #odamex, irc.oftc.net #odamex), sign up and post to our forums, or just join in some games for the final remaining days of 0.5.6. The Odamex community has come a long way in a short amount of time and we're just getting started. The sixth and final Odamex 0.6 preview. Let us know what you think about Odamex 0.6! Sign up for the forums and leave comments on this post, subscribe to Odamex on Youtube, circle and +1 Odamex on Google+, join and like the Odamex Facebook group, and get ready for Odamex 0.6 - coming to a computer near you very soon! The fifth Odamex 0.6 preview, "We Don't Need Roads", shows off some of the functions and features of the new net demo system. Make sure to leave comments, feedback, and check back next Monday for the last Odamex 0.6 preview! The fourth Odamex 0.6 preview, "Lose The Lag", displays a number of Odamex's new network enhancements. Make sure to leave comments, feedback, and check back every Monday for exciting new information! The third Odamex 0.6 preview, "Rock The Vote", details Odamex's exciting new voting system. In the second Odamex 0.6 preview, "Music & HUD", changes to the music system and heads-up display are covered. Not everything seen is entirely representative of what the final product will look like as changes are still occurring daily. Today we are glad to announce the first of many Odamex 0.6 previews. Every Monday, we will be posting a new video showing off what players can expect leading up to Odamex 0.6. Today's video, "A Comfortable Migration", covers some of Odamex's new settings that should make playing more familiar to veteran players coming from other similar engines.